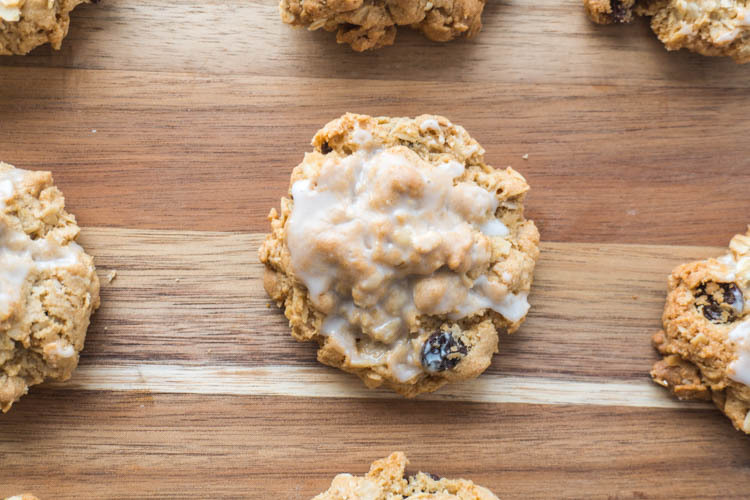 These are some of the best oatmeal cookies I have ever had! They smell amazing when cooking, they are amazingly soft and chewy when fresh from the oven, and they are super easy to make! 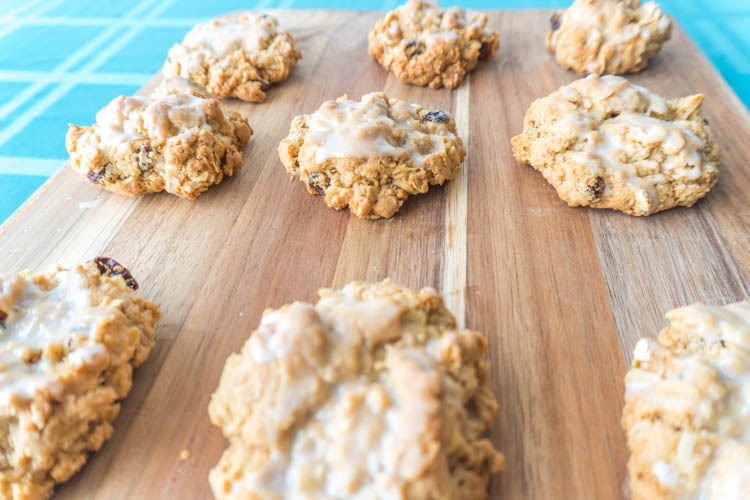 Growing up I was never a fan of oatmeal raisin cookies. I always thought- why raisins and why not chocolate chips! Let’s be honest, I still think this way most of the time! I think I didn’t like them when I was little is because I would be expecting chocolate and then get a raisin. Let’s be honest, when you expect chocolate, anything else doesn’t satisfy. 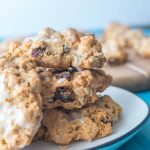 These easy oatmeal raisin cookies are super quick to mix together and will be gobbled up even faster! Simply cream the wet ingredients in a mixer and while those are creaming, mix together the dry ingredients. Then add the dry to the wet and mix. Finally, mix in the oatmeal and raisins and bake! The glaze isn’t necessary but takes the cookies to the next level. So, if you have powdered sugar and a little milk make it! You won’t regret it. While the cookies are baking, combine the glaze ingredients. I like to use almond extract in the glaze because I love the flavor, but feel free to use vanilla or omit the extract all together! When the cookies are done baking, brush with the glaze and enjoy! Now, a disclaimer- these are delicious chewy oatmeal cookies that are amazing fresh from the oven. They are also delicious when cooled and eaten a few days after making, but they will harden up. I like to store them in a Ziploc bag with as much air pushed out as possible. And when I say hard, they are deceptive in their hardness. When I first pulled a cookie out the day after cooking them I thought all was lost. They felt hard and I was so bummed. However, I decided to try one anyways and hoped it didn’t break my teeth. Well, to my complete surprise and delight I was able to bite into the cookie and I knew I had found a winner recipe. Although the outside had hardened, the cookie was chewy and still soft in the middle. The outside added a wonderful crunch that was not too hard at all, but actually quite enjoyable. I hope you enjoy these cookies as much as I do! And if you swap the raisins for chocolate chips I won’t tell anyone! 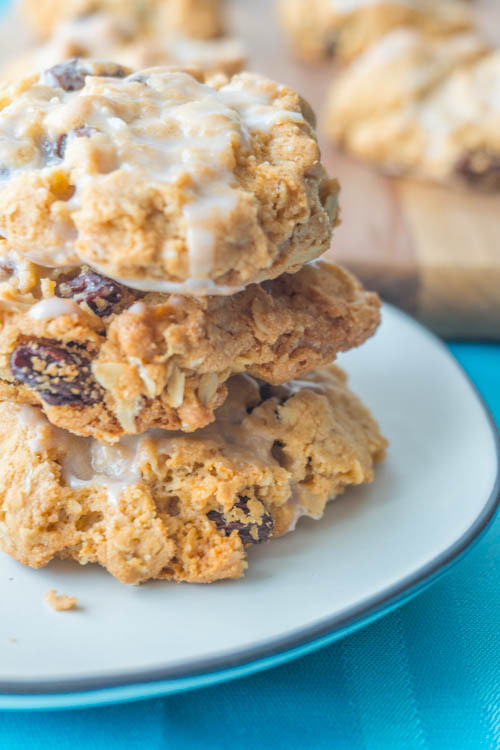 If you are as big a fan of oatmeal in baked goods as me, you will love these healthy no bake oatmeal cookies and these easy gluten free granola bars! These are some of the best oatmeal cookies I’ve ever had! Easy to make and easy to devour! Preheat oven to 350 ˚F and line a cookie sheet with parchment paper. Combine flour, baking soda, baking powder, salt, cinnamon in a small bowl. Set aside. In a mixing bowl with an electric mixer cream butter, white sugar, brown sugar, egg and vanilla. Add in oatmeal and raisin until evenly distributed. Scoop large balls of dough and place on the cookie sheet. I was able to make 18 cookies. While cookies are baking, make the glaze. Combine all glaze ingredients, adjusting milk and powdered sugar to get your desired glaze consistency. When cookies are done, let them rest on the cookies sheet for a few minutes before transferring to a cooling rack. Brush on glaze. These cookies are so good and chewy straight from the oven. Store them in an air tight Ziploc bag and they will be good for several days. They will harden over time but they remain soft and chewy in the middle with a nice crunch on the outside. I actually really like them like this! 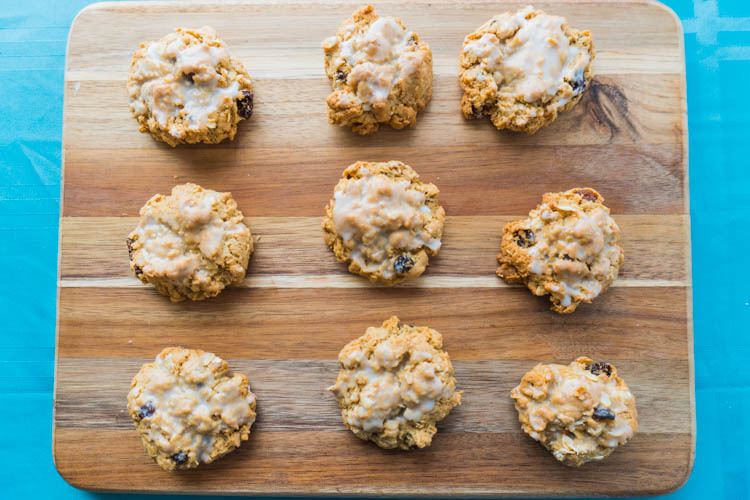 Recipe adapted from Genius Kitchen's Oatmeal Raisin Cookies.